“The Monkey’s Paw” (1902) is a supernatural tale of suspense written by W.W. Jacobs. And monkeyspawed is a slang-term I’ve heard, used by magickians to describe a particular way in which magick can rebound. For instance, Boffo and I monkeyspawed ourselves handsomely in a recent working. I had been suffering from recurrent headaches and devised a ritual to balance my ajna chakra. Boffo was assisting, so I broadened the intention to include him. “It is our will,” we declared at the beginning of the ritual, “to balance our ajna chakras”. It was a couple of weeks, and required the acumen of a third party, before we arrived at an explanation of the puzzling outcome of the working, because, the next day, I had my usual headache (although not quite as bad as usual) and Boffo had one as well. So we had indeed “balanced” our ajna chakras, in the sense that Boffo’s ajna chakra had been rendered as equally fucked-up as mine. 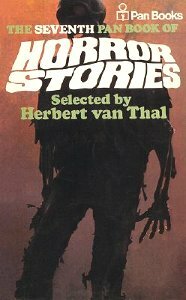 The book in which, as a kid, I first read Jacobs’ “The Monkey’s Paw”. However, the lesson of “The Monkey’s Paw” cannot be simply that magick is evil or inevitably produces harm, because the fakir who made the spell is described as “a very holy man”, and his magick (unlike White’s) is successful in realising its purpose. Yet the demonstration of the fakir’s teaching is made at the expense of others who fail to see in advance that by using the paw and asserting their own desire, they are in fact subjecting themselves to someone else’s will. Is it not odd that a morality tale highlighting the inadequacy of individual will should hinge so crucially upon language? “Getting monkeyspawed” usually implies a magickal intention that is verbally incomplete or ambiguously worded, as in the example of Boffo and I screwing ourselves over with the word “balance”. Wiccans habitually append the expression “an it harm none” onto their magickal intentions, and it might be supposed that if Mr. White had taken this simple measure it would have protected him from much distress, or at least have posed a greater challenge to the fakir’s intentions. Yet the Wiccans, sweet as they may be, are really only hedging the issue, because identifying what we don’t want to happen (i.e. harm) has always been easier than ascertaining and taking responsibility for our true desire. And is it not equally odd how the notions of imposing will and of faults in linguistic expression match so closely the two definitions of magick bequeathed to us by Crowley? Namely: (1) ‘the Science and Art of causing Change to occur in conformity with Will’ (1913: 124); but also (2) his less-quoted definition of magick as ‘a disease of language’ (1913: 185). What is this strange link in magick between the vulnerability of will and the inadequacy of language? “Disease of language” is an expression taken by Crowley from Max Müller’s ideas on the formation of myths. Müller asserted that myths were a linguistic corruption caused when abstract concepts become personified (1866: 12). 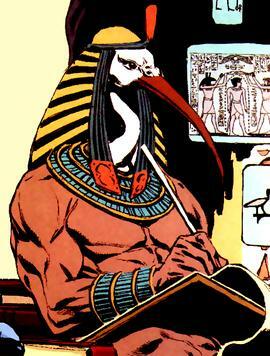 Crowley describes – for instance – how Thoth was originally just a guy who invented writing (1913: 185), not the terrible ibis-headed deity that sprang into being after writing itself was personified. Yet the advantage of personification is the creation of a linguistic hook to assist further thought. Magick, like myth, Crowley suggests, is a linguistic process for bringing the abstract into manifestation through personification. Thoth. Supernatural being, or just a regular guy who happened to invent writing? From this perspective, magick as ‘Change in conformity with Will’ is complementary, for when we will this too is a process of personification: we experience an impulse and then we own it and experience it as “ours”. Will is the personification of desire, because each time we say “It is my will…”, this is an identification with experience. Suddenly, a desire belongs to someone; it becomes what that someone wants. The act of willing brings into existence an entity every bit as mythological as Thoth: the I. For if the disease of language is personification, then every “I”, “me” and “mine” is a symptom. Given that magick consists in personification of or identification with desire, this creates the possibility of intentions that fulfil a desire which turns out not to be “ours”. In the case of Boffo and I, we both experienced headaches when we actually wanted to be free from them. A desire was fulfilled, but the identification with that desire was not. We got what we did not want because we identified a desire rather than identifying with it. We fell victim to language in its literal mode rather than the diseased form in which magick resides. Our language wasn’t diseased enough to prevent what happened from fitting the intention. If our language had been diseased enough there would have been only what we wanted in the intention (because it would have been “ours”), and so what actually happened wouldn’t have appeared to fit, and would have passed without notice. In “The Monkey’s Paw”, presumably Mr. White is identified with the desires he expresses in his three wishes. However, we have seen already that there is another desire in play, the desire of the fakir, which is namely that others shall realise their wants are ineffectual and that they are subject purely to fate. Anything Mr. White wishes for is therefore foiled from the outset. He cannot use language magically to personify his desire, because he himself is a personification within the diseased language of the fakir, a personification of the typical person who is incapable of realising his desire. The only wish of Mr. White’s that is fulfilled is the wish to send back his son to the grave. As a personification, Mr. White’s desire to cease desiring is the only one that can be met, which is associated in the tale with wishing dead the one that he loves. “The Monkey’s Paw” is a morality tale, a genre that relies on personification to transmit its message. At this level, the fakir is presumably a personification also – but of what? A number of possibilities suggest themselves. Maybe he represents the Divine, as the ultimate source of all experience. On a more psychological level, maybe he is the unconscious. Or maybe he is language itself. In any case, he represents a force that alienates us from our desire. What the story seems to demonstrate is not that magick is necessarily evil, but that its efficacy – and ours – is undermined when we are barred from the process of expressing and exploring our own desire. When we cannot use diseased language to personify desire, we are trapped in a nightmarish world where what is said is literally what is, with no space for change. The horror of “The Monkey’s Paw” is how we cease to be people and become personifications when our capacity to wish is taken away. Magick fails not when we wish for too much, but when we are prevented from engaging with our true desires. Crowley, A. (1913 ) Magick: Liber ABA Book Four. Weiser: York Beach, ME. Jacobs, W.W. (1902 ) “The Monkey’s Paw”. In: The Lady of the Barge. Sixth edition. London & New York: Harper & Brothers. Müller, M. (1866) Lectures on the Science of Language. Fifth edition. London: Longmans & Green.